I was eight when I found myself at the crossroads of Christmas belief. The perilous intersection where believing in Santa meets the acceptance of reality. I hung on with child-like confidence that my schoolyard friends were mistaken, my older siblings were wrong, that there truly was a Santa and reindeer and the North Pole. I didn’t like being laughed at for ‘still’ believing. Santa had to be real. I desperately wanted him to be real, but I definitely didn’t want to the last one to learn the truth. My parents promoted the loud charade of Santa, giving credence to my conviction in Mr. Claus. Candy filled stockings, milk and cookies for Santa, even hay for the reindeer were utter proof to my young years that Santa Claus was real. Whispered, “better be good for Santa” rang in my ears, while Holiday carols spewed from the car radio. Everywhere I turned was evidence that Santa existed. How dare my classmates tease me that there wasn’t a Santa Claus! Every member of our family had a red felt stocking, handmade by our mother, with our names sewn on the top. They hung on the wooden mantle above the fireplace just waiting to be filled by the jolly ol’ man. Even our dogs had specially stitched stockings that were bursting with rawhide treats by Christmas morn. I certainly didn’t want Santa to go away, leaving me an empty stocking. If I didn’t believe, would Santa skip our house? Would our stockings be packed away, never again to be filled chockfull of candy and toys? On the eve of Christmas, my mother would assist my sisters and I in placing a tall glass of milk and a plate of homemade cookies on the hearth, our carefully handwritten wish lists arranged by its side. Snicker doodles, Russian wedding cakes, candy cane cookies piled high on a large red platter, tasty treats for St. Nick. For weeks, Mother could be found in the kitchen, baking the most wonderful holiday confections; letting each of us kids select our favorite cookie to make. If I didn’t believe in Santa, would mother quit baking sweets, my eight-year old brain frantically wondered? Would the warm cinnamon scent waffling through the house fade away? Would there be no special dessert served after our Christmas Day dinner? Would we still celebrate Christmas? A few days before Christmas, Father would bring home a huge bale of hay. “Fodder for the reindeer”, he’d grunt, as he was hefting the heavy bale from the back of the pickup truck. Under the bright outdoor Christmas lights, he’d scatter the flakes of hay about the front yard. Eight large hay mounds tagged for the reindeer pulling Santa’s sleigh and a special one for Rudolf. Once he directed us to place apples on top of the alfalfa claiming they needed extra energy for their long night delivering presents around the world. If I didn’t believe in Santa Claus, who would feed the reindeer? Would Christmas go away? Would anyone care? For forty some-odd years, I’ve sat at the junction of believing and not-quite believing. Do I continue on the magical journey, keeping my faith in the magic of Santa? Do I take a sharp right turn, jostling the memories of filled stockings, homemade cookies and hay for the reindeer before packing them tightly away in the trunk? Last year the decision was taken out of my hands. My husband and I were asked to play Mr. and Mrs. Claus for a large family Christmas gathering. We were given a beautiful Santa suit, specially selected presents for the children, and directions on where and when to show up. My husband practiced his “Ho Ho Ho’s” while I made a list of all the “good” children’s names that would be attending. The bright red Santa suit was fur trimmed and embellished with tall black boots, a wide thick belt, and a red velvet hat. White woolen gloves, a snow-white beard and hairpiece, old-fashioned wire-rimmed glasses along with a padded under belly pillow completed the costume. 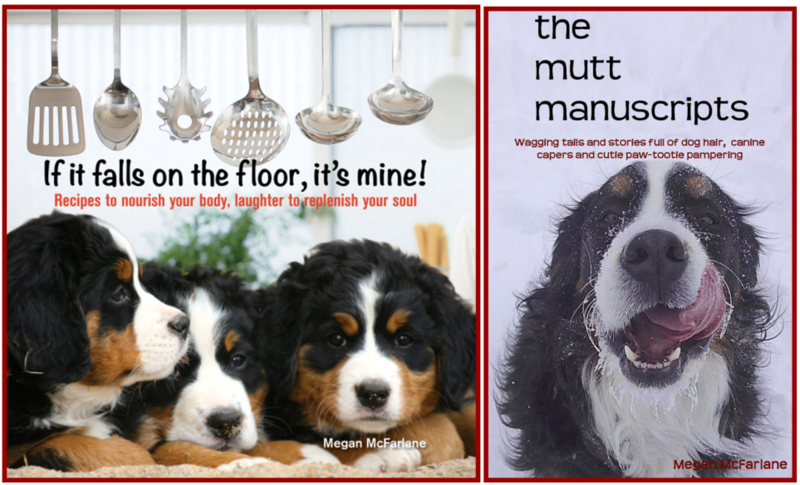 As my husband was dressing for the part, our two Bernese Mountain Dogs came in to investigate, sniffing at the strange red velvet material and pristine fur adorning the edges. I grabbed the camera, begging my husband to sit with the dogs for a brief photo op and quickly snapped some pictures before we needed to be on our way. It was weeks later that I remembered to upload the pictures to the computer. January was getting ready to turn into February before I had the time to flip through the shots I had taken. Christmas had long passed, the tree taken down, the holiday decorations put away. The spirit of Christmas had disappeared into worrying about paying the bills. I sat at the computer and pulled up the pictures from Christmas. 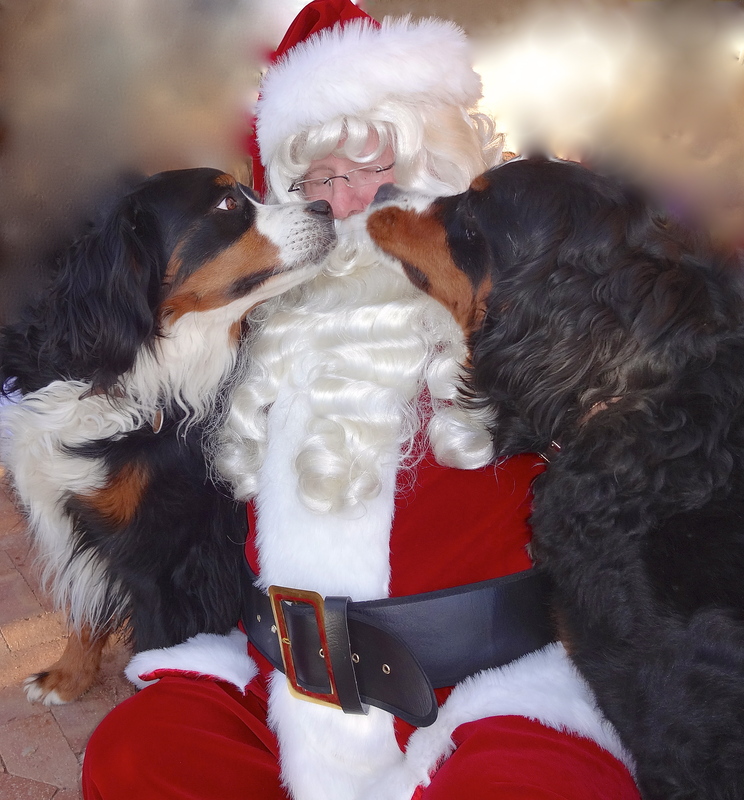 Jeffrey Moussaieff Masson once said, “Questers of the truth, that’s who dogs are; seekers after the invisible scent of another being’s authentic core.” I looked at the first photo on the screen, seeing our two Berners with Santa. The opening photo revealed our dogs, Dolce and Amore, nestled beside Santa, glazing up at him with wonder. They were enchanted with Father Christmas, enthralled with his inner spirit, his big heart, his jolly laugh. The adoration in their eyes shone with true belief. Santa’s authentic core was laid bare by the truest of seekers. And, there was Santa, eyes closed, basking in the joy of unselfish affection, unconditional love. I knew without a doubt, weeks into the new year when Christmas was a long past remembrance, it didn’t matter whether you are a just turned eight year old or way past the half-century mark, Santa was real and would be forever. not a creature was stirring, not a mutt nor a hen. The stockings were hung by the dog door with care, in hopes that St. Bern soon would soon be there. while visions of rawhide and bones danced in their heads. With Amore in her ‘kerchief, and Dolce in her cap, they had just settled down for a long canine’s nap. when, what to my wondering eyes should appear, but a miniature dog sled and eight tiny Terriers. I knew in a moment it must be St. Bern. “Now Rover! Now Ruddy! Now, Pepper and Buddy! On, Daisy! On, Charlie! On, Duke and Harley! 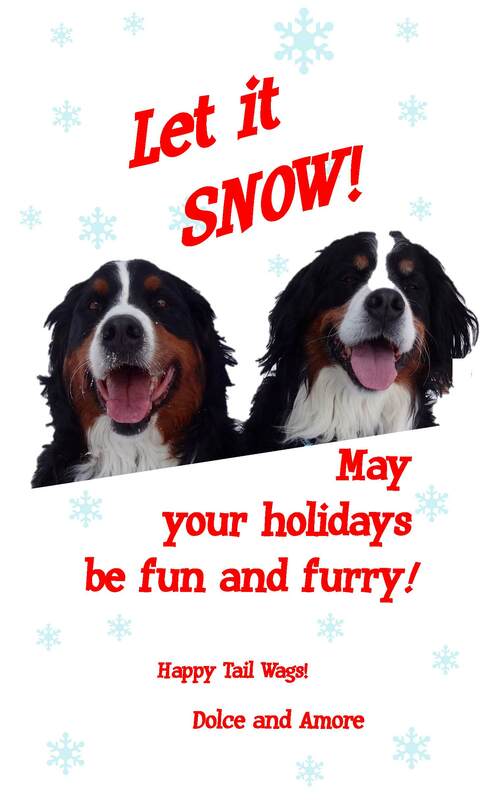 so up to the house-top the coursers they flew, with the sled full of toys, and St. Bern too. the prancing and pawing and a little woof woof. As I drew in my head and was turning around, down the chimney St. Bern came with a bound. and his clothes were all tarnished with ashes and straw. A bundle of treats he had flung on his back, and he looked like a peddler just opening his pack. His eyes–how they twinkled! His jowls, how merry! His tail curled over, his nose like a cherry! His long muzzle was drawn up like a bow, the whiskers on his chin was as white as the snow. He had a broad face and a big round belly, that shook when he barked, like a bowl full of jelly. and I laughed when I saw him, in spite of his strut. and filled all the stockings with treats and jerk. And laying his paw aside of his nose, and giving a nod, up the chimney he rose. Red or Green? and, no, I’m not talking about what color holiday wrapping paper to choose from. We’re talking chile here. If you ever find yourself in New Mexico, the official state question is red or green, referring to the type of chile you prefer. For those that enjoy both red and green, just say “Christmas” – you’ll get a colorful plate of both. Me? I like red, red smothered over a breakfast burrito, red cheese enchiladas and red pork posole. And, I like green, chile verde (green chile stew) and green chile cheeseburgers. When it comes to red, New Mexico is split down the middle between liking Chimayo Red or Hatch Red chile. North of I-40 and you’ll be a Chimayo Red fan, anything south of the interstate and you are in Hatch territory. Wars have been fought over which tastes better. Families split over chile feuds. Restaurants battled over reigning chile champs. I-40 is New Mexico’s chile line in the sand. However, most of New Mexico’s cuisine leans towards the green chile. Roasted, peeled and chopped, green chile goes with everything! From turkey to cheeseburgers to eggs to wrapped in a heated tortilla with a little butter and salt. Green is usually considered spicier, red is said to be gentler, but more pungent. Some say green will vary in heat, hitting speeds of extremely hot to barely mild, while red is steadier in its heat gauge. So, red or green? What will it be? Next time you’re in New Mexico and asked this question, if you can’t decide, just ask for “Christmas”. A chile treat worthy of the holiday! My father grew up on a large cattle ranch on the central coast of California. The ranch cook was Hispanic and would serve a big Mexican Dinner for the cowboys on Christmas Eve. Tamales, rice, beans, homemade tortillas, even natillas! Dad carried on the tradition, abet a little more gourmet, and on Christmas Eve he would cook up a big fancy Mexican meal. One of my favorite dishes was his crab enchiladas with green tomatillos sauce. Merry Christmas! SALSA CON TOMATILLOS: Drain the tomatillos and reserve the liquid for later use. Fry 2 tortillas in oil or lard until lightly browned. Break and drop into the half of the juice of the tomatillos. While these are soaking and getting soft, saute the onions, chiles, cilantro and garlic mashed in salt in oil/lard. Saute until soft but not browned. Put the tomatillos, softened tortillas with juice, saute mixture, broth, cumin, and 3 drops of green food coloring in the blender. Blend until smooth. Transfer to the skillet and simmer for 10 minutes. Remove from heat. Sauce may be used as is or strained for a smoother more professional presentation. SOUR CREAM SAUCE: Combine all of the ingredients and stir gently to blend. Cover with plastic wrap and refrigerate until ready. CRAB: Combine the crab, onions, chiles, and 1/2 cup of cheese in a bowl. Moisten mixture with a little of the leftover Tomatillo Sauce. ENCHILADAS: Heat the tortillas in the oil or lard until they are soft. About 1 minute. Add more oil as necessary. Dip each tortilla in the Tomatillo Sauce. Place 1/4 cup of crab meat in the center of each tortilla. Spoon a little Salsa Con Tomatillos on each. Roll the enchiladas and place them in a shallow baking pan. Cover with the remaining Salsa. Sprinkle generously with shredded jack cheese and bake at 400 degrees about 10 minutes or until hot and the cheese is melted. Serve with a dollop of Sour Cream Sauce and garnish with olives, avocado, tomato slices and pieces of crab leg. Credits: Raymond G. Marshall, started the famous chain of Acapulco Mexican Restaurants in California. This is the original recipe and was the house specialty.